Ocean kayaking is a unique extreme sport that comes with extreme serenity. In the remote fjords and iceberg bays of Greenland that experience comes with additional tranquility. For me day one and two were everything, but tranquil. There were meetings, meetings about having meetings, discussions, votes, conflicts, pretty much everything short of a whiteboard and donuts. Should we go left or should we go straight? Should we kayak in windy conditions or should we turn back? Are we there yet? Can we take a break? It sounded more like a road trip with the kids, which no mid-life person wants under any condition. The arrival of Bal, Emily and Beni was a breath of fresh air at our first camp some 25km from the start. The last time I saw Beni was 3 years ago in the African bush wearing a pink polo shirt and holding a undoubtedly dead goat in his hands. He was about to cook. Beni on the 2015 Budapest-Bamako Rally carrying a freshly slaughtered animal for a goat cabbage stew. This time Beni was holding a nearly dead cod. “Can someone please kill this fish? I’m a pacifist, I can’t do it”, proclaimed the Swiss engineer. Beni, who did his Swiss Army service by rebuilding a church in Cuba as a conscientious objector doesn’t kill goats or fish, but is well versed in the art of outdoor cooking. In fact Beni doesn’t go camping without fresh ingredients or his travel spice rack. He’s the guy to call if you ever run out of cinnamon on the frozen tundra or need a pinch of fenugreek on the savannah. I didn’t know how well I’d get along with him since we never traveled together. But by building a campfire together, we soon discovered our shared passion for pyromania, which kindled a newfound bromance atop the permafrost. Emily and Bal fresh from a spa treatment at the Ritz Carton in Moscow looking adorably Greenland compliant in their matching mosquito hats and couture dry suits. It takes a tough man to wear a pink bathing suit. Midnight rainbow over the first camp site. Day One- I was ready for everything, but not for this. Long distance kayak trips start with eating well and strenuous mental preparations. Half of the team was mentally unprepared while the other half was on a strict alcohol, sugar and tobacco diet. Adrienne announced that she eats only chocolate for breakfast. Janos arrived in Greenland with a case of Tuborg and swore that he’s not going to paddle without a few shots of Palinka (brandy) in the morning. Others stuck to a strict chocolate cream cookie, Coca-Cola, Marlboro and paprika sausage regime. Gabor simply never ate breakfast because his priorities lied in oversleeping and meticulously rearranging his gear. The chain smoking, cookie eating, brandy drinking set was almost ready to sail until two people decided that kayaking on open waters might be too dangerous. I was prepared for everything, but not for the comically painful fjordside drama unfolding in front of my eyes at T minus 8 hours. Adrienne and Norbi gaining valuable insight into sea kayaking before settling for a tandem kayak. The village of Narsaq and its stunning bay. Couldn’t fall asleep in the setting sun at 11:30PM. Narsaq base camp. I was ready for almost anything. Home made iceberg fridge with cream cheese, kefir and a mild overdose of smoked herring. On the morning of July 10th after another shot of palinka and bar of chocolate all 10 of us sailed from the iceberg strewn bay of Narsaq into the unknown. With global warming came swarms of irritating arctic mosquitos and flies. Certain parts of South Greenland are intolerable without mosquito face masks. Day Zero – It’s just the tip of the iceberg. Our flight from Copenhagen landed in Narsarsuaq (population158). It’s the world’s smallest town served by an international airport (UAK). The town has a friendly grocery store, an almost friendly hostel, a café and even a museum. The museum hosts artifacts from Narsarsuaq’s World War II era US army base and a fascinating Viking exhibit almost entirely downloaded and printed from the internet. You need a waterproof dry suit to kayak in icy waters. Unlike in a wet suit, you should never pee in a dry suit. 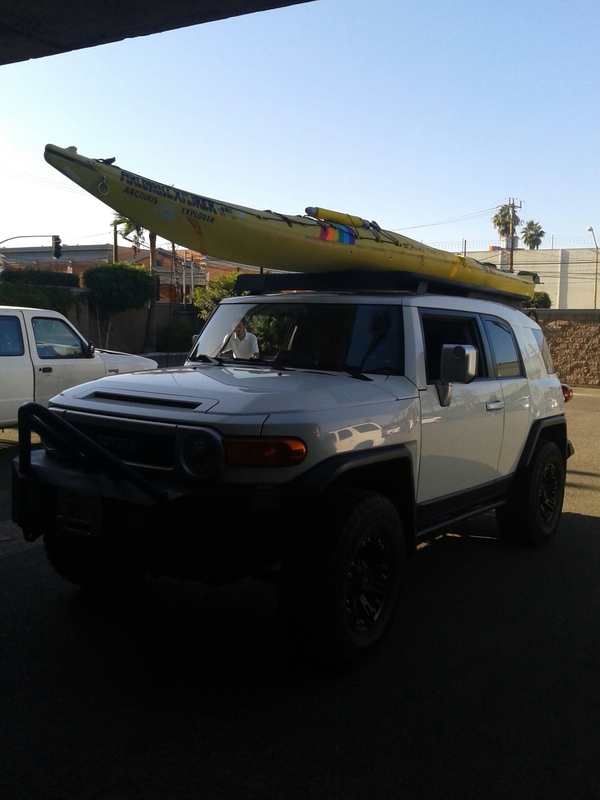 Never fix a rental kayak while on the water. The water is f*ing cold. Whoever coined the expression, “it’s only the tip of the iceberg” was a very serious science person. An iceberg’s density is 920kg/m3, sea water’s density is 1025kh/m3. That roughly 10% difference is exactly the tip of the iceberg, which never stays under water. In other words 90% of each iceberg is under water. If you love distilled water, icebergs can make a delicious snack. Things will get wet even if you don’t pee your pants. You can camp outside the airport. Also, some icebergs can really sound like French fries in oil. It’s called the “Bergie Seltzer”. It happens when ice around the compressed air bubbles melts and the bubbles pop. Icebergs also crack, break, tip over and move around. So if you kayak close to an iceberg, you might not even notice that a 15 ton ice cube just fell on your head and pushed you against 90% of the iceberg. According to seasoned kayakers these incidents can generally ruin even the best kayak trips. Kayaking close to an iceberg is not a very smart idea. Don’t try this at home. As we leave on a 10 day kayak expedition to Greenland to raise awareness about the plight of the arctic, Greenpeace goes to fight arctic oil drillers. In the age of accelerating global climate change, when we most need to keep new fossil fuels in the ground, the Norwegian government has opened up a brand new area of the Barents Sea, above the Arctic Circle, for oil drilling. The Barents Sea is experiencing the lowest sea ice it has ever seen. It is utterly irresponsible to go out looking for more oil on a planet that is being steadily overheated by the oil we have already dug up and burned. So with the backing of a wide coalition, Greenpeace and Nature & Youth have filed a historic lawsuit against the Norwegian government. After my euphoric solo voyage from La To Tijuana, I set my sights on another cause and another destination that’s been close to my heart: The Great North. What started out as another “one man and his kayak insanity” to Greenland, has now turned into an Arctic summer camp for mid-lifers. Thanks to social media, 12 friends and friends of friends decided to join me on a week long paddle among the fjords of South Greenland. What was once akin to “Into The Wild” has now evolved into “The Bad News Bears Of Greenland” or “City Slickers Of The Ice”. The team has three doctors, several engineers, two software developers, a woman who doesn’t know how to swim, a guy who’s only seen kayaks on TV before and another who’s generally afraid of water. The decay of the Arctic, the disappearing ice sheets, the dying polar bear populations and increased human activity have all triggered my desire to kayak in this part of the world. This is the frontline of global climate change and the message needs to be louder and clearer than ever: Save The Arctic. My “home made” map of the itinerary. Notice how many of the places we’ll be visiting don’t even have official names. 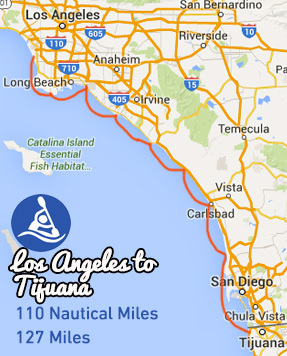 Watch the film about a 10 day solo kayak trip from Los Angeles to Tijuana. The Arcoiris Explorer and Andrew G. Szabo set out on an unusual ocean kayak journey along the California coast to bring attention to tuna over fishing and the plight of our oceans. Sign the petition to establish ocean sanctuaries to help tuna populations heal and grow. After being home for more than a month, I’ve managed to upload my favorite pictures. Human blood sells better than tuna blood. Three local journalists came out to the beach to cover the story about tuna overfishing and my beach landing. One of them had to leave before I arrived because someone got shot in the head. Even though 2 and half people get murdered on a normal weekday in Tijuana, he still found a neighborhood bloodshed more appealing than the global plight of tuna. The remaining journalists were attentively listening to the problems of destructive tuna fishing right in front of the US-Mexico wall. 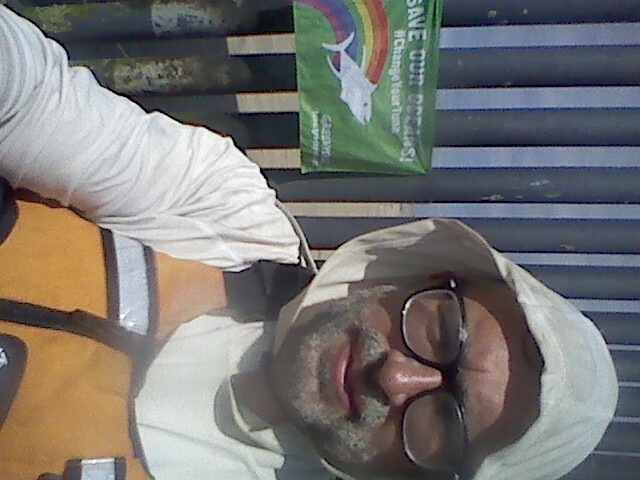 The steel bar fence symbolized that tuna destruction is a global problem where walls and borders are irrelevant. 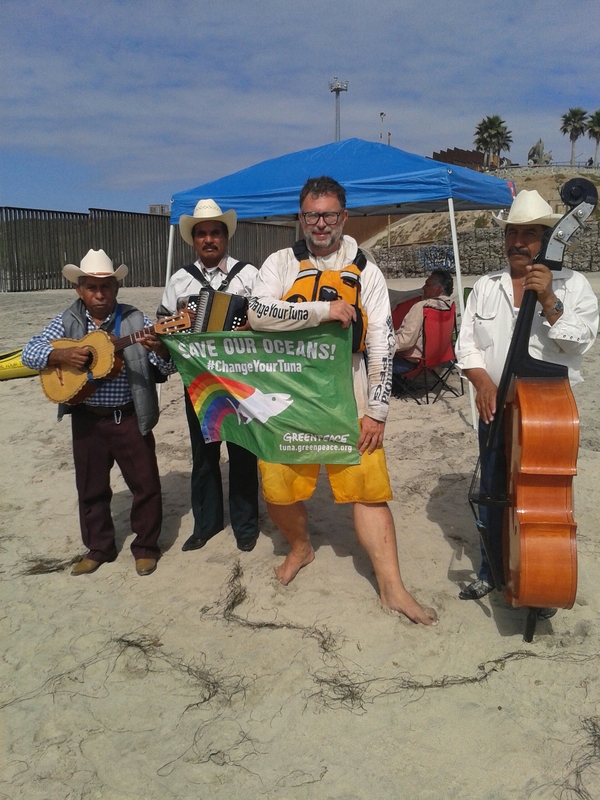 In addition to campaigning for sustainable tuna consumption, I bashed Donald Trump a little, talked about the beauty of Mexico, praised this year’s agave harvest and invited them to have tequila with us. They both said it was better than covering a murder. Here’s what you can do to Change Your Tuna. After spending my last night on a gorgeous, virgin beach in Point Loma overlooking the city of San Diego, I set out for the final push with the morning high tide. Navy helicopters, cargo ships, submarines and jetski gangs killed my ocean zen. I also couldn’t spot Tijuana properly. What I tought was TJ was in fact still the US. 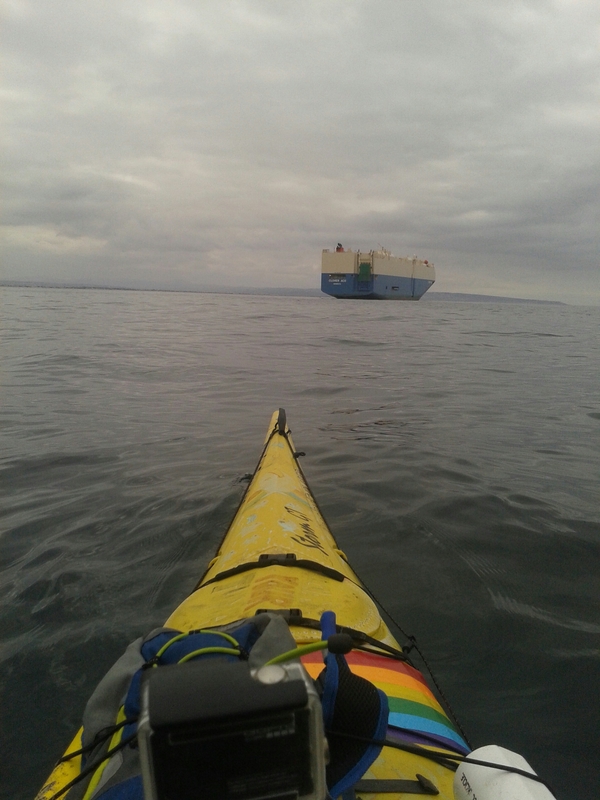 It was a bit of a letdown to paddle 3.5 more kilometers against the current. Dolphins and seals escorted me on the final stretch. 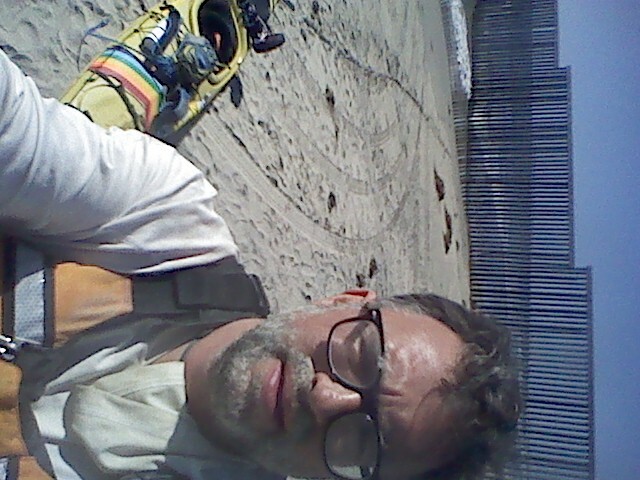 The Arcoiris Explorer and I landed on the beach in Tijuana at 14:35. Local news, mariachi musicians and TJ friends made up the welcome committee. Tequila and euphoria are my dominant body chemicals right now. I hope I can gather my thoughts in a day or two and summarize this very special adventure. Cargo ship waiting to enter San Diego Bay. Day seven started out hard off the beach in Encinitas. I was craving some performance enhancing drugs. Then I realized that I already maxed out the family CVS card. Here are my drugs and health aids of choice. 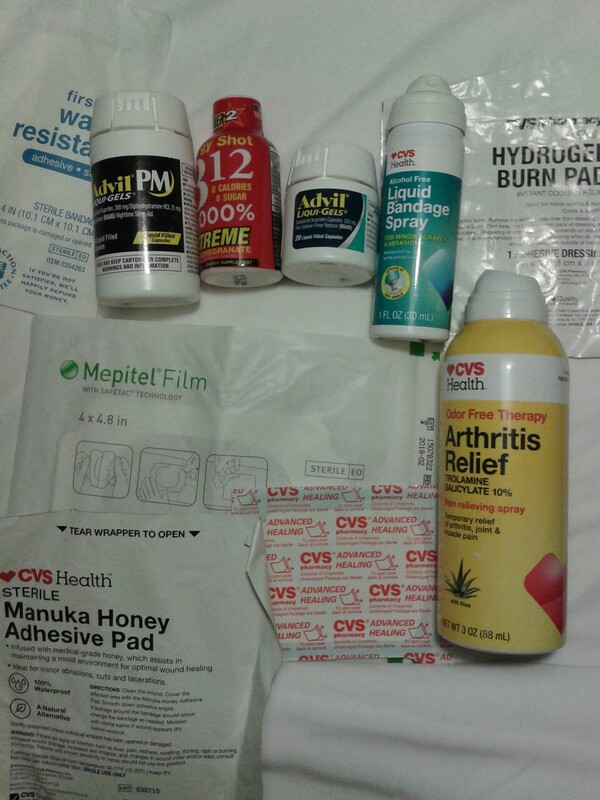 Bandages, ointments, joint pain releif spray, Advil for the daytime, Advil PM for sleeping like a baby in a tent, B12 energy shots when I want to feel like a Russian weightlifter.